Leytonstone-born Murkage Dave has found himself at a unique crossroads between musical styles and practices. Obsessed with music, he moved to Manchester under the guise of university, but quickly dropped out and started pursuing whatever he could to anchor his life around his passion, cutting cult garage records and promoting legendary parties. His debut album ‘Murkage Dave Changed My Life’ sees him returning home to East London, witnessing the changing landscape and gentrification, and inspiring him to write a set of twelve “folk songs for the culture”. These include existing singles ‘Put You On My Shoulders’, ‘You Always Ring Me When I’m Busy’ and ‘Magic Mission Deja Rinse’, as well as instant fan favourites ‘Keep Up The Bad Work’ and ‘Niggas Need Each Other’. As a singer and songwriter, Dave Murkage has crafted a versatile sound, rooted in a youth spent listening to garage and R&B, but also revealing formative years absorbing The Smiths and Joy Division. 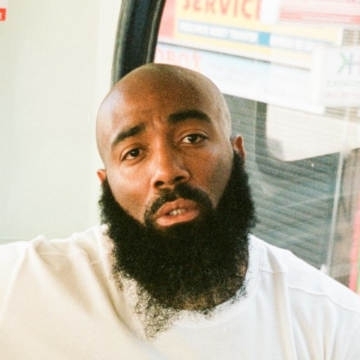 It’s no surprise that his defiantly British sound is still attracting fans globally, and he’s collaborated with Mike Skinner, Jaykae, Skepta and French producer Hologram Lo, as well as reaching the ears of Pharrell Williams, Young Fathers, Iggy Pop and Beastie Boys member Mike D.